You don’t have to travel to every corner of the world to experience the different delicacies that the planet offers. 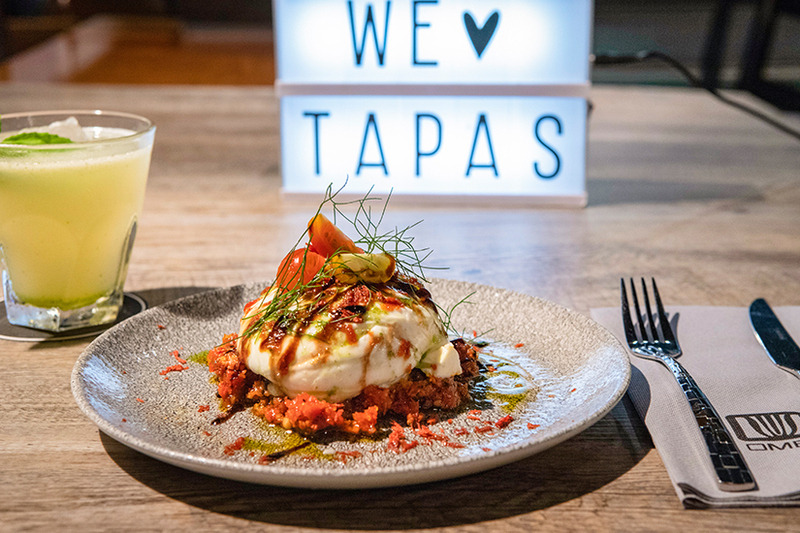 Here at our restaurant in Palma, OMBU, we have available on our menu some tasty tapas sized treats from many different countries which are full of authentic flavours. In continuation we will be talking about some of our dishes which represent the different cuisines of the world. Will you take this adventure with us? In this dish we head over to an island nation in the Pacific Ocean, Japan. Home to various different types of seafood, prepared in skilful and delicate ways. We present our smoked mackerel sashimi, a technique described as thinly slicing extremely fresh raw meat or fish, our smoked mackerel sashimi is accompanied by a crispy rice, mentaiko and a touch of kizami wasabi. A perfect balance of textures and flavours. Bao Buns or baozi as they’re also known are white, warm soft buns. These buns are said to have originated in China and made popular by immigrants travelling across Asia to other countries. They are delicate bite sized meals, usually filled with a type of seasoned meat. At OMBU, restaurant in Palma, we decided to do things a little differently by stuffing these steamed buns with delicate crispy squid. An Asian technique using fresh native produce. This particular dish fuses two very unlikely partners in a unique flavour sensation. Carpaccio is the thinly slicing of a raw meat or fish which originated in Venice in the second half of the twentieth century. Using this extremely popular technique we serve a tapa of octopus carpaccio with a Thai twist, we pair the octopus carpaccio with a foam which holds a taste of the east with fragrant and tantalising spices. Nothing quite says Italy like a delicious and flavoursome pasta dish. In this dish we use traditional Italian ingredients to bring you a heart-warming and flavour filled dish. Lamb stuffed cannelloni with roasted onion sauce, a coriander pesto and apricot puree. The perfect dish to try for if you enjoy Italian cuisine but with an OMBU touch. Sometimes a dish doesn’t need to be overly complicated for it to shine, it can rely on a key ingredient as the main star. Here at OMBU, restaurant in Palma, we have a very special dish to offer you. It is centred on a black Angus entrecote, which originates from the USA, accompanied by a truffle parmentier, fried eggplant and pepper emulsions. A truly luxurious cut of meat with the most complementary garnishes. Here at OMBU, restaurant in Palma, we have a great selection of tapas for you to try for if you want to taste the flavours of the world. In this article we have named a few of our favourites from our tapas in Palma but if you want to try them for yourself then don’t hesitate any longer and reserve your table at our restaurant in Mallorca and take your culinary journey around the world.